Exosomes are nanovesicles shed by cells as a means of communication with other cells. Exosomes contain mRNAs, microRNAs (miRs) and functional proteins. In the present paper, we develop a mathematical model of tumor–immune interaction by means of exosomes shed by pancreatic cancer cells and dendritic cells. Cancer cells’ exosomes contain miRs that promote their proliferation and that inhibit immune response by dendritic cells, and by CD4+ and CD8+ T cells. Dendritic cells release exosomes with proteins that induce apoptosis of cancer cells and that block regulatory T cells. Simulations of the model show how the size of the pancreatic cancer can be determined by measurement of specific miRs (miR-21 and miR-203 in the case of pancreatic cancer), suggesting these miRs as biomarkers for cancer. 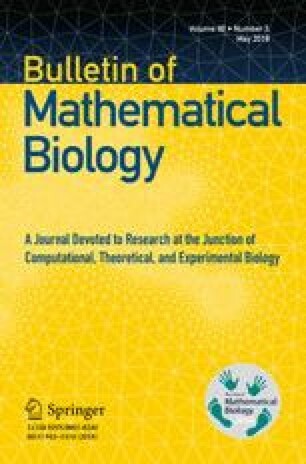 The authors have been supported by the Mathematical Biosciences Institute and the National Science Foundation under Grant DMS 0931642.